Stay up to date on what's happening. To submit newsworthy items, please contact us. To gain the hashkafa of the Yeshiva, we suggest you listen to these shiurim first. Please review our schedule to learn of minyan and shiur times throughout the week. Thanks to YU Torah for allowing us to use their audio search technology. To join the effort in tagging these shiurim, please contact us. Subscribe your email and/or your text email to receive our notifications. Please see our chart to learn what your text email is. A new fund in Shmully's memory now provides for families with their most basic needs. Please read and support this important cause, in Shmully's memory. Please take a moment to look at the flyer about the Avi Pincus Physical Education Program taking place at Priority 1 and consider making a donation. A big part of Avi's life was about helping others. What better way for us to continue that ideal than in starting a program in a school that benefited Avi, and currently benefits many kids that would otherwise have no other option. This is a small but appropriate way to honor and remember Avi, while also making a positive impact on others. We hope you will join us in contributing to this meaningful cause. When making a donation, please include "Avi Pincus Physical Education Program" in the note. 733 Cornaga Court, Far Rockaway. Now you can support YBT with your purchases! 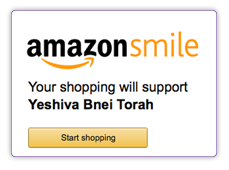 Click the banner below to purchase on Amazon and YBT receives .05%. NEW: Donate to YBT online using Paypal. 100% of your donation is received through their Giving Fund.